Are you looking for a reliable dog walking service in Fort Collins? Look no further. Your pets are guaranteed to love invigorating, Daily Dog Walks, provided by our top dog walkers! Fort Collins offers plenty of exciting routes for your pet's walk. We also offer professional, reliable and affordable pet sitting, tailored to meet your needs. You can rely on Hustlin’ Hounds. Find out why Hustlin' Hounds is regarded by many as the best dog walker and pet care service in the Fort Collins area. Dog walking has never been so good! 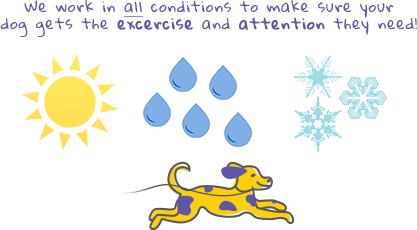 Each walk includes one-on-one time for your dog and all walks are planned for your dog's individual needs. Daily dog walks include exercise, play time, changing water, feeding, hugs, kisses and more! Walks given by our dog walking specialists save you time and ensure your pet receives the VERY BEST daily care for their optimal health and well-being. Fort Collins offers plenty of exciting routes for your pet's walk. Discover why Hustlin’ Hounds is the Premier Dog Walking Service in the Fort Collins area! I invite you to give us a call to discuss your dog walking needs. Hustlin’ Hounds can contribute to your pet’s well being and your peace of mind. Also, be sure to keep us in mind for pet sitting. Find out why Hustlin’ Hounds is regarded by many as the best dog walker and pet care service in the Fort Collins area.